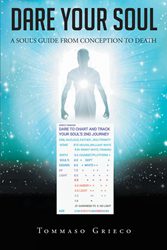 Tommaso Grieco’s newly released “Dare Your Soul: A Soul’s Guide from Conception to Death” is an absorbing book on the spiritual light of souls and the metaphysical world. “Dare Your Soul: A Soul’s Guide from Conception to Death” from Christian Faith Publishing author Tommaso Grieco is a thought-provoking work on the answers that people seek when it comes to the soul’s journey on earth, explaining the step-by-step phases in life—from conception to what is beyond death. “Dare Your Soul: A Soul’s Guide from Conception to Death”: an appealing account on what it takes to deepen one’s spiritual knowledge and make the spiritual light grow within. “Dare Your Soul: A Soul’s Guide from Conception to Death” is the creation of published author, Tommaso Grieco, an Italian American citizen residing in San Diego, California, and Toronto, Canada. Published by Christian Faith Publishing, Tommaso Grieco’s new book introduces the notion that all forms of life contain spiritual light, and as human beings reproduce, the truth that there are “bad seeds” who contribute to the impact of injustices to humanity should be considered. The different phases in life are discussed to further elaborate why bad things can happen on different life seasons—most likely, a flawed acquired education and mindset complicates a person’s life. View a synopsis of “Dare Your Soul: A Soul’s Guide from Conception to Death” on YouTube. Consumers can purchase“Dare Your Soul: A Soul’s Guide from Conception to Death” at traditional brick & mortar bookstores, or online at Amazon.com, Apple iTunes store, Kobo or Barnes and Noble. For additional information or inquiries about “Dare Your Soul: A Soul’s Guide from Conception to Death”, contact the Christian Faith Publishing media department at 866-554-0919.